LA B Maj. Majewski, Bernard S. Memories of My Barefoot Days Around Countryside Stone Ridge. 1991 21 cm. 222 pages. Ill.
A year's nostalgic adventure. Chapter by chapter of a boy's life in the rustic countryside. LA 974.746 Don Donlon, Hugh. 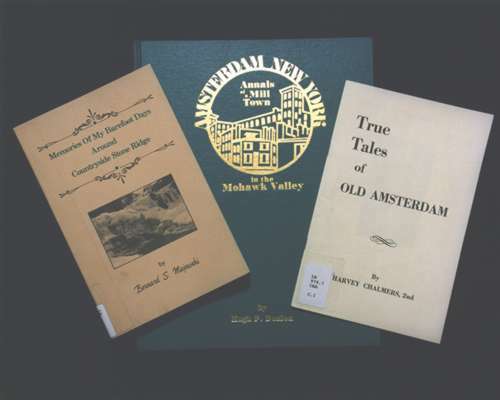 Amsterdam, New York: Annuals of a Mill Town. Amsterdam, NY: Donlon Associates, 1980 29 cm. Ill.
A very informative book delving into the past of a very successful mill town from its beginning and the changes that have taken place through the years. There are many photographs of great historical significance of the mills, streets, etc. A must when doing a study of Amsterdam, N.Y.
La 974.7 Cha. Chalmers II, Harvey. True Tales of Old Amsterdam, 2nd edition. 21 cm. Unpaged. A small pamphlet with delightful tales of Amsterdam and area. Mr. Chalmers was one of Amsterdam's local authors who made a great success of writing may historical books such as Drums Against Fontenac and The Last Stand of the Nez Perce. Copyright © permission granted by Joan Orzolek to reprint the cover of Memories of My Barefoot Days Around Countryside Stone Ridge by Bernard S. Majewski.